Bribes, fixed races and other skullduggery. 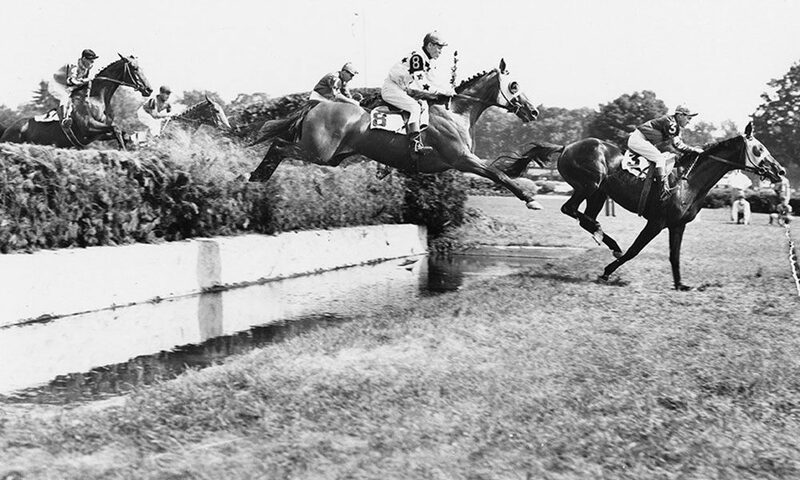 In 1933, a steeplechase race similar to the one pictured here, was fixed so that a horse named Cito would win. Three jockeys were suspended for their part in the fixing of the race as it was said that they did everything but get off their horses and wrestle with the horses to ensure that Cito won the race. Fixing a horse race is not easy. Bribing a jockey or trainer might be the straightforward method for a nefarious character looking to tamper with a race, but the horses will have a say in the outcome and no amount of money will sway them. Over the years there have been a number of schemes, scams and crimes at the track that may be of interest to those seeking to learn of the darker side of the summer season at the Spa. In 1907, George Boles was a commissioner of the Metropolitan Turf Association and one of the most successful bookmakers in the betting rings at the New York tracks, including Saratoga. During the summer meeting that year, rival bookmakers noticed that Boles was quite successful in predicting upsets and suspected he was in collusion with some of the jockeys to manipulate the outcomes of certain races. With rumors swirling, and an investigation into his activities seeming to indicate that he had bribed jockeys, Boles suddenly retired from the betting ring and the Metropolitan Turf Association. His retirement closed the matter as far as track authorities were concerned and nothing more was heard of the potential scandal. Another example of skullduggery on the part of the jockeys at the Spa occurred in 1933 when a steeplechase horse, Cito, was entered to run on the card for August 15. The morning line showed Cito as the heavy favorite but some peculiar betting before the race drew the attention of the bookmakers who refused to continue accepting bets once they suspected something was amiss. Once the race started it was clear that Cito was the slowest in the field, but the other horses were ridden so poorly that it was obvious to all in attendance that Cito had been predetermined as the winner. One horse was described as taking so wide a turn that it was thought its jockey was headed for Yaddo. Another jockey drew his mount so far outside that he dragged another horse with him, almost into the grandstand. One reporter felt the jockeys did “everything but get off and wrestle with their steeds.” The performance of the jockeys all but confirmed the rumors that the race was fixed. Cito won the race by a neck and three jockeys were suspended immediately for their part in the affair. Perhaps the most interesting ne’er-do-well to be captured at the track was a horse painter named Peter Christian Barrie. Barrie was an Englishman who spent several years acquiring various horses, doctoring their appearance to match a worse runner and substituting the “ringer” in obscure races, thus cleaning up at the betting window. Barrie developed a paint the held up under rain and sweat for over a month, filed down, whitened or discolored teeth to match the original horse, and matched lip markings with a tattoo needle. Barrie spent four years travelling the country, plying his trade at various tracks and working for the mob with the Pinkerton Detective Agency hot on his trail. In 1934 he, along with several accomplices, was arrested in Saratoga Springs suspected of attempting to steal a horse in broad daylight using forged ownership papers. No doubt the horse was destined to be “painted” by Barrie and run again in the place of another horse. Barrie had an alibi, though, and was released by Saratoga Police, only to be turned over to immigration authorities and deported to England where he lived out his days in relative obscurity. Barrie did not limit his tampering with race horses to working on their physical appearance; he also was reportedly a sponger and doper. Sponging is the practice of pushing a sponge or piece of silk into the nostril of a horse prior to a race. The obstruction remains undetected and does not seem to affect the horse until the race is run and the labored breathing of the animal causes it to run slower than it would otherwise. Doping is the administration of drugs to an animal to either improve the performance of the horse, or to slow the animal down, depending upon how the bets are to be played. During the golden era of the gangsters at Saratoga, sponging and doping of horses was occurring more frequently than track officials would probably like to admit. In 1931 a man named Jimmie Meehan was indicted for running a widespread race fixing ring where he paid associates to dope and sponge horses, including the horse Sun Mission at Saratoga. Meehan was an associate of gangster Arnold Rothstein and it was at Meehan’s apartment where Rothstein had lost a reported $300,000 that he was slow to pay on, just days before Rothstein was murdered. In fact, Meehan was held briefly by authorities in New York in connection with the murder but was eventually released. The fact that a Rothstein associate was fixing races at Saratoga in 1931 should have surprised no one. Horse dopers were active in Saratoga throughout the 1930s. Ladana was poisoned in 1931 and although doping and sponging were made felonies in 1932, in 1934 a state senator publicly stated that he had information that the extent of sponging and doping at the tracks, including Saratoga, would “shock the nation.” The doping continued throughout the decade and on August 27, 1938 the Times Union reported the names of eight horses that had been tampered with during the summer meet. It was so bad that the owners of Triple Crown winners Gallant Fox and War Admiral had security assigned to them 24 hours per day when they were stabled at Saratoga in 1931 and 1938 respectively. Bettors at the track assume that the races are run fairly. That has not always been the case at Saratoga. Despite its reputation as the premier thoroughbred meeting for many years, Saratoga was not immune from the influence of those looking to beat the book makers by whatever means necessary. Whether it was bribing jockeys to help Cito in his steeplechase race, Peter Barrie painting and substituting horses, or the more disturbing practices of sponging and doping horses, the races have not always been run on the level. The trouble at the track is just one more example of the wonderful, colorful history of Saratoga Springs.